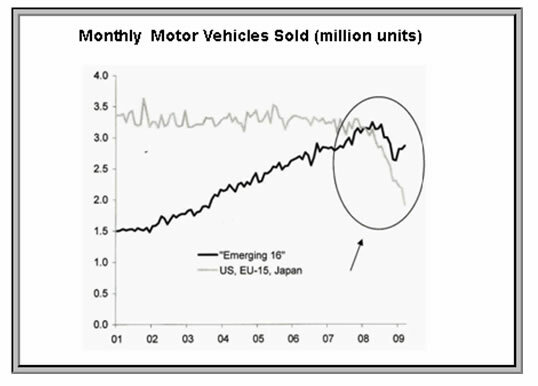 Are Emerging Market Economies Leaving Us in the Dust? 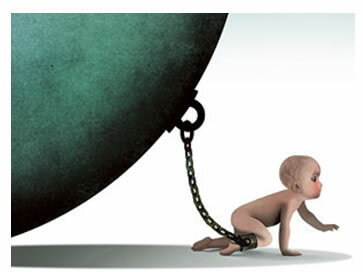 Nassim Taleb, author of The Black Swan, co-authored an editorial which appeared in the July 14th edition of the Financial Times, titled “Time to tackle the real evil too much debt”. The dirty little secret is that there is no avoiding the necessary pain and sacrifice that must occur in the aftermath of what can only be described as a period of the greatest overindulgence in the history of the world. Debt was the drug of choice and now we will continue to experience the inevitable hangover. 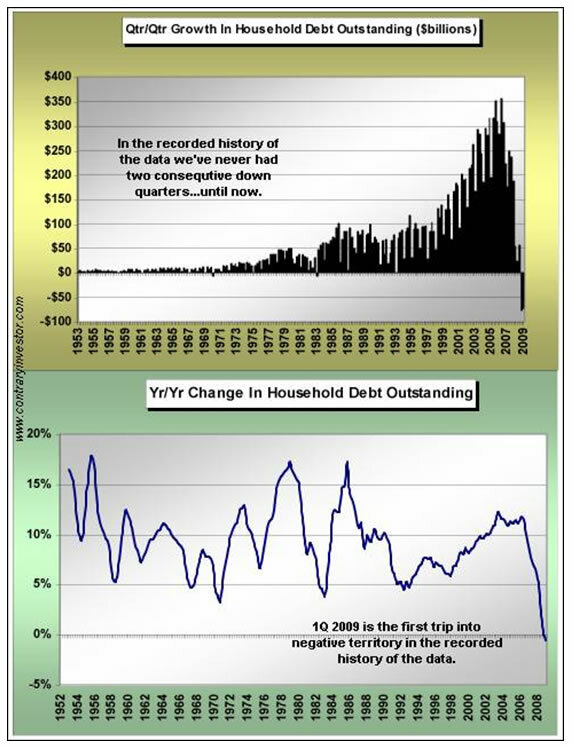 Looking at the two jaw-dropping charts below, it should be quite obvious that it will take quite some time to burn off the excess debt that was created. Multiply that baby by $300 million and you have a good picture of our predicament. The deleveraging process is likely to be every bit as painful going down as is was delightful on the way up. The question for investors is how in the world do you make money in an economy saddled with debt? At some point, as the private sector off-loads its debt to the public sector, the safehaven status of US treasuries becomes called into question. And American companies are staring down the barrel indebted consumers whose savings rates are likely to climb possibly into double digits as they try to restore family balance sheets. Not a whole lot of potential there except for perhaps investing in publicly-traded debt collection agencies. Many strategists and pundits who are consumed in the “inflation/deflation” debate and who are trying to time the sequence of when money velocity (M*V=P*Q) will once again rise and unleash torrent of trillions of dollars of newly minted money (or will the artful central bankers around the world withdraw the appropriate amounts at the exact appropriate time and execute the most beautiful and deftly-executed “exit strategy” of all-time) should consider a more important question…namely, are emerging markets leaving us in the dust? Two components are necessary in order for this to occur. The emerging market countries need to have the willingness and ability to do so. It was thought that they did back in 2007 when the term “de-coupling” swept the investment world’s stage. The theory was that China and other emerging countries we see their economies and financial markets move in directions independent of the US and the developed world. We all know how that turned out. But much has changed since then. The Asian-exporting countries, particularly China, are keenly aware of the charts similar the ones posted at the beginning of this article. When the Japanese commissioned the Maekawa report in the mid-1980s in an effort to break their dependence on exports, it was not clear, as it is today, that the US consumer is “down for the count”. They didn’t have the incentive, as the Chinese do today, to make the change. The recognition by the export-driven parasites that they need another host country for nourishment will force economies like Taiwan, Singapore, Hong Kong, Indonesia, South Korea and others to seek another alternative destinations to deliver their products. China is a prime candidate. China, while having a huge trade surplus with the US, has had almost an equally large trading deficit with its regional partners. This trend should likely reverse with the US and accelerate with SE Asia and the commodity-producing countries. Many will correctly point out that China (and the other BRIC countries) does not yet have the ability to absorb the loss of consumption that continues to occur in the US and the western world. This is true. However, the moment that it becomes clear that the emerging world will in fact supplant the developed world in consumption, the primary concerns will no longer rest upon how long it will take the West to deleverage or whether or not money velocity will pick up to let loose hyperinflation; rather, it will be on how fast investment dollars flow from the West to the East as investors rush to price in this watershed event and current and capital accounts surpluses and deficits eventually come to stage stunning reversals of capital and goods flow. No sooner did Bloomberg run and article earlier in the week (“Emerging Markets Priciest Since 2007 When Shares Fell”) then did the emerging markets, in true contrarian fashion, collectively take off again, exceeding the highly-celebrated weekly gains (once again) experienced in the US market indices. The article pointed out that the last two times the in which the valuations of emerging markets were higher than developed markets (2000 and 2007) it marked a major “top” with a crash in all world markets soon to follow. Will the third time be the charm and will emerging markets leave us in the dust for good? I think it is safe to conclude that gains in emerging market “real economies” relative to gains (or continued losses) in developed countries will continue and will enentually translate to developing countries capturing a greater share of overall world stock market capitalization. I fear that this trend will not stay under the radar of the world’s institutional investor’s for much longer. While the focus for now remains on restoring the economic vitality of the US and the rest of the in-debted developed world, and on the impact of the highly-anticipated exit strategy, if it becomes clear that the the BRIC countries have transitioned from an export-model to more balanced and domestically-oriented approach, then we might be reading about a different kind of “exit strategy” -- how to exit capital investments in the West and to migrate them to the East and the rest of the developing world. A contributing writer to GreenFaucet.com , Kurt Kasun writes a high-end investment timing service, GlobalMacro, which is focused on identifying opportunities that produce returns in excess of market with reasonable risk. He is strategically located in Washington , D.C. , a key to maintaining contacts and relationships which help Kurt understand global policy and economic factors as they emerge. His investment approach has always been macro in nature largely due to his undergraduate studies at the U.S. Military Academy at West Point (B. S. National Security, Public Affairs, 1989) and his graduate studies at George Mason University (M.A. International Commerce and Policy, 2006).